Let's start the hunt! 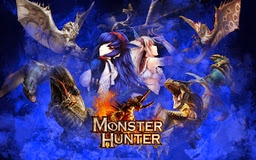 Or my new Monster Hunter wallpaper. I did not really expected to make any new wallpaper this year (I don't plan to make any Xmas wallpaper like the last years). But for some reason I did have "nothing" to do + free time & also did have a idea for this wall. This wallpaper was really fast complete (for my standards). Like by my previous Monster Hunter wallpaper I used characters illustrated by Kizuki Aruchu (Official Page | Twitter | Pixiv).